Conditions: This is an exposed and sunny venue which dries quickly. 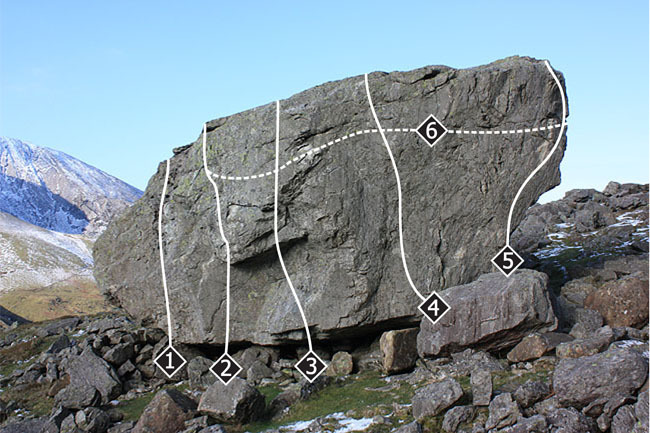 There are some seepage issues on the main boulder; for example, the start of Toe Dragon is often a bit wet. Despite its altitude and decidedly ‘mountain’ feel it is possible to climb here right through the winter, provided there is enough sunshine. Approach: Park in the large lay-by beneath the steep scree. Walk along the road in the direction of Ogwen Cottage for about 100m before heading steeply up the hillside, staying right of the Gorse slope. The most pleasant line trends rightwards before kinking back left. A couple of small blocks are passed before it is possible to contour leftwards above the Gorse to arrive on the hidden grassy plateau. 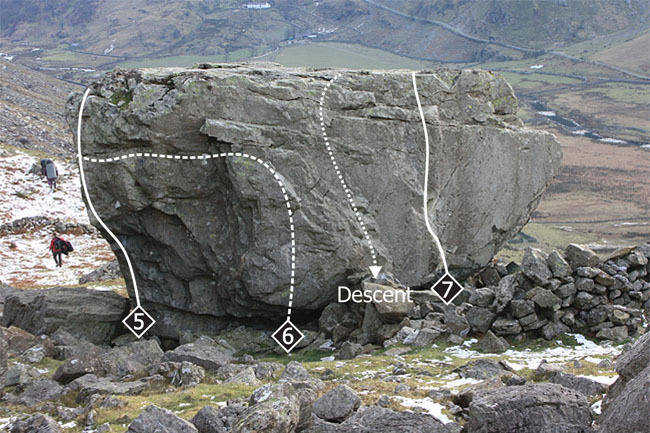 The first boulder is reached quickly from the edge of the plateau. The faint groove on spiky holds. Pull through the left side of the small roof, just right of the faint groove. Pull up the blunt rib at the right side of the small roof. 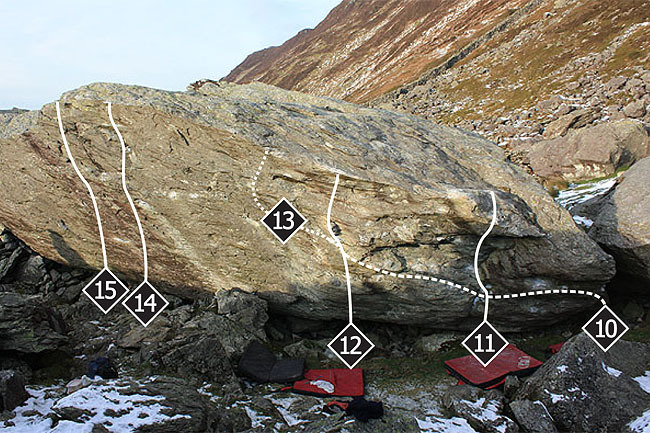 The sit down start on the lower ramp is a painful 6B+. The clean wall left of the arête from a sit down start. The next good boulder lies 30m over to the right. 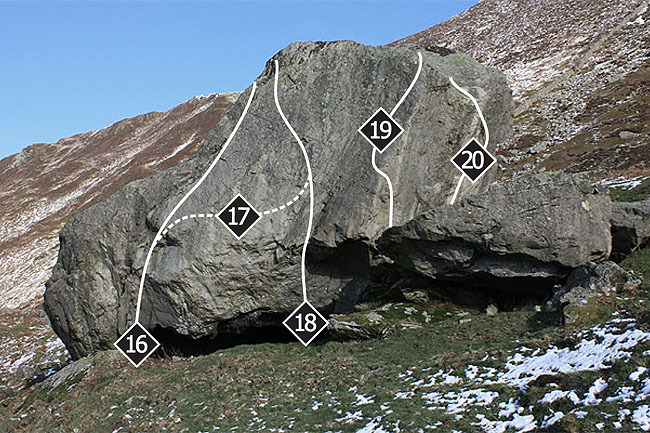 On the far side of the plateau is the main event: a big overhanging block, ringed on its steep front face by a sheep pen wall. There is an isolated block perched on the edge of the plateau, approximately 40m from the Main Block. 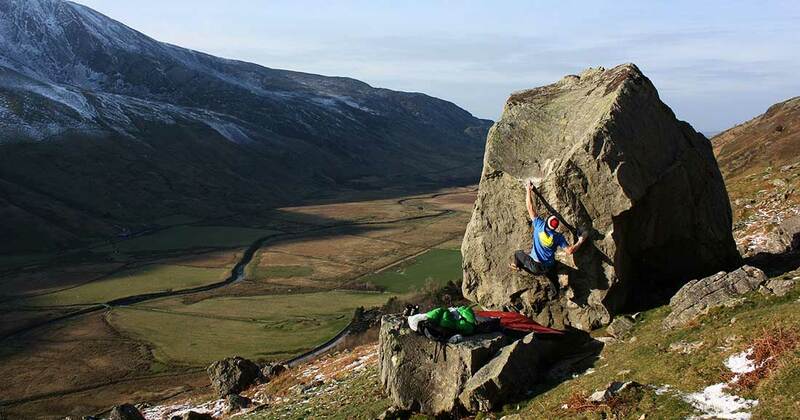 It offers several fine problems and the famous ‘pinch’ problem. The diagonal crack feature is a delight. The sit down start boosts the grade to 6A. Climb through the bulge – at the weakness just left of the adjacent platform – to gain the hanging slab. Bear left to finish. Step up and balance round onto the front face. 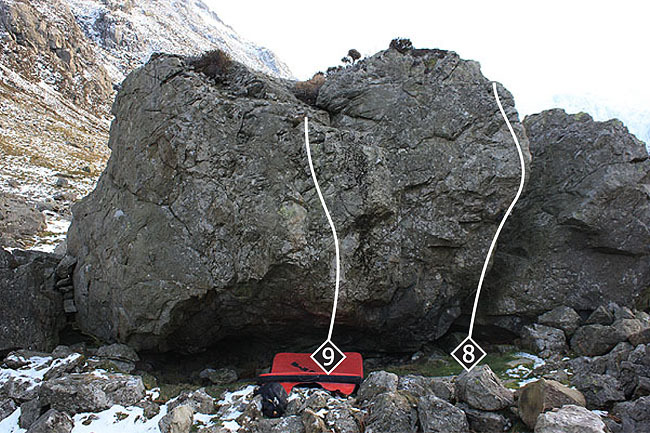 The 6B+ sit down start has tricky, barndoor moves.